The College of Sciences at the University of Louisiana at Lafayette will officially become the Ray P. Authement College of Sciences during a 3 p.m. commencement ceremony at the Cajundome Convention Center on May 24. The Board of Supervisors of the UL System unanimously approved the change at its regular monthly meeting in April. 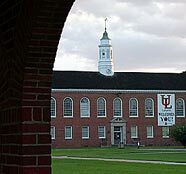 UL Lafayette Vice President for Academic Affairs Dr. Steve Landry and UL System Vice President of the Board of Supervisors Winfred Sibille formally requested the naming change in a letter to UL System President Dr. Sally Clausen. “ We believe that Dr. Authement is very deserving of having the College of Sciences named in his honor,” they stated in the letter. Authement, the longest serving president of a public university in the country, announced his retirement last year. Dr. E. Joseph Savoie, Louisiana’s Commissioner of Higher Education, will replace Authement. Authement has ties to the college that date back more than 60 years when he was a student studying physics and mathematics. The naming will be a hallmark of Authement’s retirement recognition “because it honors – permanently – a great man, a visionary and a leader,’ said Julie Simon-Dronet, director of Public Relations and News Services. The college has continually received funding via grants from renowned organizations like the National Science Foundation and the National Institutes for Health. Funding awards such as these directly contribute to the university’s designation as a “Research University with High Research Activity” from the prestigious Carnegie Foundation. Both of Authement’s daughters are graduates of UL Lafayette and on Saturday, he will award his first grandchild his college degree. Philippe Prouet II, a biology major and son of Authement’s late daughter Kathy, will be the first graduate of the Ray P. Authement College of Sciences. There are about 135 faculty members in the College of Sciences. Many of them have helped create academic and research programs that have earned national recognition. ’ s departments include biology, computer science, chemistry, geology, health information management, mathematics, physics and renewable resources.